At the end of World War 2, the Canadian government opened a university overseas to start the process of reintegration of soldiers into civilian society. The school was called the KHAKI UNIVERSITY, and was set up in the UK. The students at the school were simulating "civilian" life, and they were issued a battledress uniform without rank. The students were issued shoulder titles and slip-ons which indicated the House (dormitory) to which they were assigned. 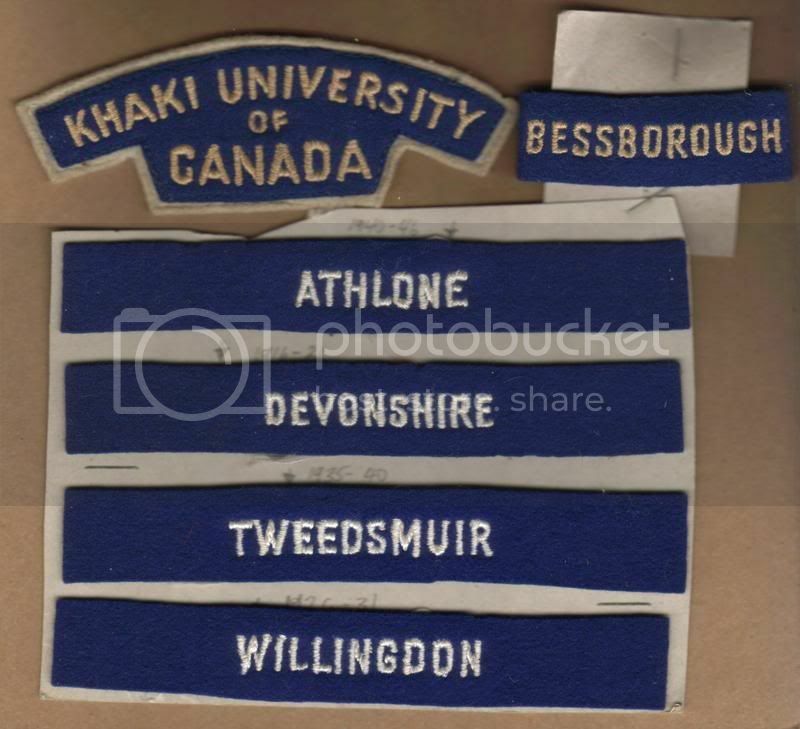 The univesity named buildings and facilities after Governor Generals of Canada to give the facility a "more Canadian" feel, and the dorm slip-ons reflect the names of previous Governor Generals. Nice badges, Bill! Stuff you certainly don't see around too often. Keep 'em coming! They did the same prior to the end of WW1 also here are the hat badge and collars. They did have a cloth title which is extremely rare have only ever seen two. Your WW11 cloth is also very rare I have only seen the shoulder for sale once did it come out of the UK ? The post WW2 Khaki University was an interesting organization. It was intended to be a step towards civilian life, and was organized to start soldiers on their post military education. As such, the Khaki U de-emphasized military heirarhcy. The students did not wear headdress, webgear, gaiters or boots, but shoes instead. All of this was done to get them out of the military way of life. In the school, rank would not be recognized and every member of the Khaki University was given a plain battledress and issued the shoulder titles and the House slip-ons. There were five houses for students, named after governor general's of Canada. The five identified by slip-ons to date are Athlone House, Bessborough House, Devonshire House, Tweedsmuir House, and Willingdon House. Attached are a couple of links to photos from LAC of members at Khaki University. The slip-ons in the photos appear to be Devonshire. Interesting comment about the rarity of the titles. I have seen several of the shoulder titles over the years, both at shows and on ebay. The slip-ons on the other hand are very scarce. I have seen a couple of Bessborough, but the other ones I had never seen until they were acquired from a Canadian vendor. Paul, can you give a description of the title for the WW1 Khaki U? Last edited by Bill A; 06-03-08 at 02:44 PM. Last edited by guest_000; 06-03-08 at 03:36 PM. Just to give a kick-up on this subject. Private Doreen Exler, Canadian Women’s Army Corps (C.W.A.C. 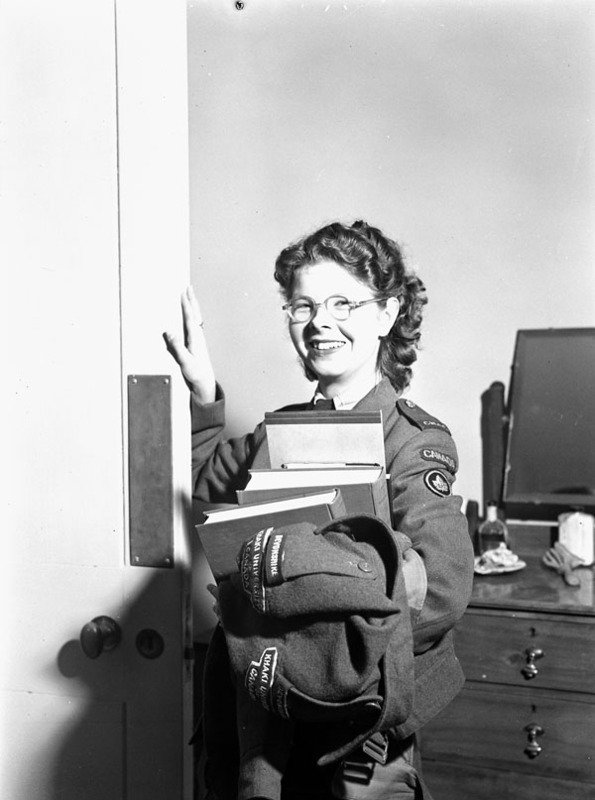 ), a student at the Khaki University of Canada, Leavesden, England, 14 September 1945. Sergeant Frank Hazelwood, Royal Canadian Army Service Corps (R.C.A.S.C. ), who is studying Biology and English at the Khaki University of Canada, Leavesden, England, 21 September 1945.